Home > Vintage Western Shirts > All Vintage Western Shirts > (XS) Mens Vintage 1970's Western Shirt, Shades of Red, Blue, Never Worn! 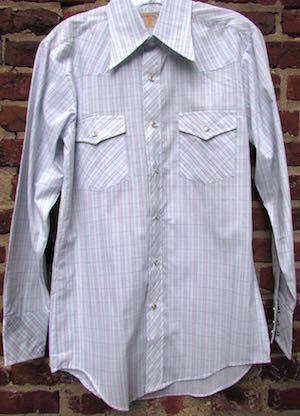 Mens Vintage 1970's Western Shirt. 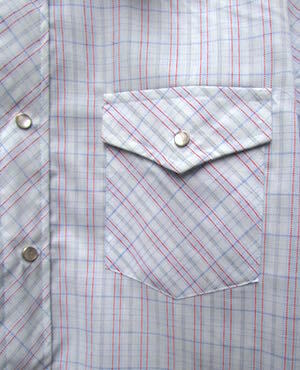 Shades of Red, Blue and Gray in a Plaid-esque pattern! Six Pearly snaps down the front with three more on each cuff. Snap closure patch pockets on each side of the chest. Tapered hem with long, pointy 1970's collar. Tagged by Travers. 65%/35% poly/cotton.